All transactions are safe and secure with a reliable history in online purchasing behind each of our associates. Buy the Dr. Seuss Quote shirt to own Dr. Seuss clothing and merchandise. 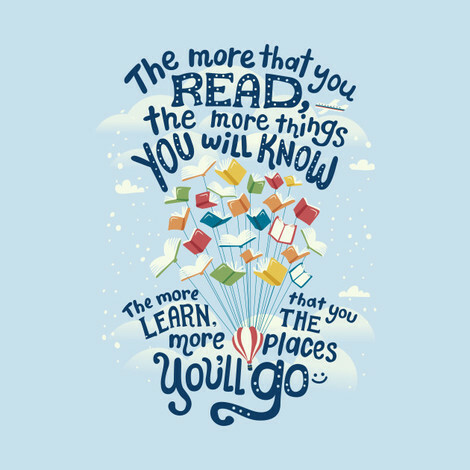 The Dr. Seuss quote on the front of this t-shirt emphasizes the power of reading. "The more that you read, the more things you will know. The more that you learn, the more places you'll go." Expand your knowledge while getting lost in a great story. Pair it with Thing 1 and 2 shirts for adults for a fun combo. In addition to the Dr. Seuss Quote tee above, browse the Dr. Seuss Clothing Gallery for more apparel like men's and women's clothes, kids shirts or hoodies.